The heart and soul of Special Olympics Oregon begins in the hometowns of our athletes. While SOOR is rebuilding a sustainable organization that will provide Olympic-type year-round sports and athletic competitions for children and adults with intellectual disabilities for decades to come, we had to make the difficult, but responsible decision to temporarily suspend regional and state competitions. However, our mission continues to live in communities across the state as our athletes train and engage with their friends and teammates, which is being funded through locally-raised dollars. Your participation and fundraising for Polar Plunge directly impacts athlete experiences at this local level, as $25 from every plunger goes directly to the Local Program in the plunger’s community! The Polar Plunge is a unique opportunity for individuals, organizations, and businesses to support Special Olympics Oregon athletes by jumping, walking or slowly crawling into the frigid and icy Oregon waters. The event is open to the public, and all spectators are welcome free of charge. For more information about the 2020 event, please contact Special Olympics Oregon at 503-248-0600, [email protected]. Portland, OR. The Milagro Latino Theatre company is featuring The North American Premiere of La Segua, a cautionary tale by playwright Alberto Cañas Escalante. La Segua transports audience members to 17th Century Costa Rica where ambition, narcissism, and madness abound. Inspired by the legend of la Segua, Cañas crafts a story of two young lovers who are haunted by a ghost standing in the way of their happiness and sanity. The play runs through March 2nd at the Milagro Theatre, at 525 SE Stark Street, in Portland. TICKETS: Adult tickets are $27 in advance, $32 at the door. Additional discounts for groups 15+, and welcomes Arts for All pricing. In the city of Cartago in colonial Costa Rica, a beautiful woman, Encarnación Sancho, is haunted by the spectre of La Segua, who appeared to her former suitor, driving him mad. Blaming herself, Encarnación resists starting a new relationship with a new suitor, Camilo de Aguilar, a fortune-seeking adventurer who has fallen in love with her. In La Segua, Cañas takes a hard look at Costa Rican values, including ambition, hypocrisy, and follows themes of machismo, vanity, and narcissism. A cautionary tale for all to heed. La Segua is a Costa Rican legend designed to scare men into being loyal and staying close to home at night. As men wander home, often drunk, a patch of fog appears, and in it stands a beautiful woman, with porcelain skin, long black hair, and big dark eyes. Charmed by her beauty and forgetful of their relationships, the men offer to accompany her home. But when they turn to look at her, their dream is really a nightmare. The beautiful woman has disappeared and has been replaced by a monster with a horse’s head, accompanied by burning red eyes and big yellow teeth, terrifying the men (sometimes to the point of killing them) and in some cases making them lose their minds. La Segua has a variety of origin stories in Costa Rica. One version says that in colonial Cartago, a young woman fell in love with a Spanish officer who eventually left her, prompting her to wander the streets of the city forever, on the lookout for men to torment as revenge. Another version relates that also in Cartago, the town’s most beautiful young woman was invited to a dance by a wealthy Spaniard. However, her family refused to let her attend due to his “don Juan” (term for a man who seduces women) reputation. The young woman lashed out at her mother and was punished by an otherworldly force who made it so that men would always be drawn to her because of her body but would flee when they saw her horse face. He wrote La Segua in the late 1960s in an effort to reconnect and modernize myths and legends, especially his own. The play premiered as the closing performance of the First Central American Festival of Collegiate Theatre in 1971, and was revived by the National Theatre Company in 2015 in his honor after his death in 2014. In La Segua, Cañas draws on Costa Rican folklore to criticize the country’s attitudes toward beauty, a message impactful far beyond Costa Rica and long after the play’s 1971 debut. In an epilogue to the play, Cañas explains that he wanted to play with mythology, and he found his chance while glancing through a history book. He stumbled upon the story of two women who were accused of being witches in colonial Costa Rica. In the account, Cañas saw the perfect moment for la Segua to appear. In the play, she doesn’t actually make an appearance, but her presence is alluded to and feared. Carlos Escalante Macaya was born in Barcelona, Spain of Costa Rican parents. He studied at the University of Costa Rica in the School of Musical Arts. During his studies, in 1992, he won the “September 15” Permanent Central American Contest for his piece “Violin and Piano Sonata”. In 1995 his opera “The Two of Us”, book by Carlos Tapia, was produced at the National Lyric Company. He has written music for orchestras as well as chamber music, film scores, choral music, music for dance, and a large variety of incidental music for theatre. He moved to Cape Town, South Africa in 2000, where he completed his post-graduate studies with Maestro Peter Klatzow, a former student of famed French composer Nadia Boulanger. He currently teaches at the National Music Institute and the University of Costa in the School of Musical Arts. Roy Antonio Arauz is a Costa Rican-American director, choreographer, and Milagro’s Producing Creative Director since 2016. Select directing credits: Anna in the Tropics (Latino Theatre Projects); The Gene Pool, The Temperamentals, The Hen Night Epiphany (Arouet); La Mariposa (Book-It, touring); My Mañana Comes(Associate Director, ArtsWest); Annie, The Music Man (Driftwood Players); The Humans (Assistant, Artists Rep); Éxodo (Co-director, Milagro). Choreography credits include: Female Hitchhikers(Consenting Adults, Helen Hayes Award nomination for Outstanding Choreography); Annie, The Wizard of Oz (Snoqualmie Falls Forest Theatre.) He founded and was artistic director of Arouet in Seattle from 2011–2015, and is a founding member of Theatre9/12, where he was mentored by Charles Waxberg. He is a member of the Latinx Theatre Commons Steering Committee, the 2015 Lincoln Center Theater Directors Lab, and the 2016 Directors Lab West. The Milagro MainStage theatre company produces a full season of regional or world premieres, including one Spanish language play each year, as well as its long-running Día de Muertos signature production. Teatro Milagro, Milagro’s touring and arts education program, presents its original bilingual plays and educational residencies to diverse and underserved communities across the nation. Milagro provides a home for Latino arts and culture at El Centro Milagro, where it enriches the local community with a variety of community engagement projects and educational programs designed to share the diversity of Latino culture. Tricia Sipowicz and Kristin Collins, who shared her “Edison Story” about the positive impact the school has had on her entire family. Edison parents Linda Pollack, Cathrine and Stefan Olander, and Eileen Day. Edison Board Member, Ann Brayfield, with Edison President, Sean Preston. Friends Shiree Ferguson, Emily Shields, Kathi Austin, and Deedee Dolp enjoy their first Partner with Edison Breakfast. Student speaker, JP Mulligan, jokes with his parents during his moving speech. Rose Kilpatrick and Jesuit Counselor and Head Football Coach, Ken Potter. Welcome to Edison High School, the only high school in Oregon and Southwest Washington dedicated to serving students with complex learning differences. Our work here is powerful and profound: helping every student reach his or her full potential. As a small, private school, Edison High School offers an individualized curriculum that meets each student’s special needs, and maximizes the ability to learn. We also provide the emotional support that builds confidence and maturity. By empowering students with learning differences to experience academic success and personal growth, Edison does more than prepare teens for the future. We change lives. Portland, OR. Fright Night might be fun for humans, but it can be scary for pets. Excited trick-or-treaters, tempting candy and spooky costumes can all pose threats to furry friends resulting in serious health issues. Doctors at DoveLewis Veterinary Emergency & Specialty Hospital offer helpful advice for keeping pets safe during Halloween celebrations. Animals in costume should be supervised at all times. Some pets may chew pieces of their outfit and ingest them, causing intestinal obstruction. Also, if a costumed pet escapes or is frightened away, the outfit could get caught on trees, fences or bushes, and pets can get hurt or stuck in the process. Keep an eye on your pet and snap a few photos like the ones below, then remove. Monitor candy and treats at all times, and keep them out of reach. Chocolate is highly toxic to pets, and other candy can cause significant gastrointestinal upset. Additionally, lollipop sticks, plastic parts and wrappers can cause intestinal obstruction and potentially rupture a pet’s intestines. Be sure to remind children that exposing pets to these treats can be dangerous. When leaving the house, don’t leave candles lit – even if they’re inside pumpkins. When the house is occupied and candles are lit, be sure they are clearly out of reach and monitor pets at all times. Keep decorative lights out of reach, especially from curious puppies and kittens. One chewing session can be dangerous and even deadly. If pets are injured or become ill due to any of these holiday hazards, owners should seek medical treatment for them immediately. DoveLewis Emergency Animal Hospital, established in 1973 and based in Portland, Oregon, is the only nonprofit, 24-hour emergency and intensive care unit in the region. With 45 years of service to the community, DoveLewis has treated more than 500,000 animals. DoveLewis also has seven donor-supported community programs that serve animals in need and the animal-loving community. For more information, please visit dovelewis.org. West Linn, OR. Over 300 people gathered at a West Linn country estate in support of Albertina Kerr. It was the third year for the one-of-a-kind experience combining a unique country gala and a Mercedes-Benz Amateur National qualifying golf tournament. Hostess Carilyn Alexendar, welcomed Event Chair David Manougian, his daughter Emma, wife Lori, and Justin Berry to the benefit. The fundraiser on September 15th was expected to raise over $300,000. Part of the evening included a silent auction. There was time for cocktails, live and silent auctions, dinner, music, dancing, and more. The Country Gala is followed by a golf tournament at Columbia Edgewater Country Club where the two winning twosomes will receive all-expense paid entry to play in the prestigious Mercedes-Benz Amateur National Tournament at the Four Seasons near Dallas, Texas. Since 1907, Albertina Kerr has strengthened Oregon families and communities. Today, we provide programs and services to children and adults with developmental disabilities and mental health challenges, empowering them to live richer lives. 24 Hours of Kerr raises funds for essential services including crisis psychiatric care for kids in imminent danger of harming themselves or others, and crucial support for people with developmental disabilities. Join us today and earn your wings. Keep drinking water bowls full of cool, fresh water. Provide shaded areas where a pet can rest if outdoors. Keep an eye on pets around water—not all pets are natural swimmers. If your pet is overcome by heat exhaustion, immediately immerse or spray the animal with cool running water (avoid cold water as that could cause shock) and continue until the body temperature lowers. Give your pet water to drink and consult your veterinarian right away to determine if additional treatment is needed. Utilize a kiddie pool for dogs to splash and relax in. Use a misting hose to provide a cool area for a pet while outside. Do not leave pets unattended outside when it gets hot; bring them inside. Leave your pet at home when you are running errands – never leave your pet in the car when the weather is warm. Download an infographic that shows how hot a car can get. -colored pets can sunburn—check with your veterinarian before applying sunblock to your pet’s nose. High energy dogs will likely not have as much energy on a hot day, so lowering the normal level of activity is very important. Walk or exercise your dog when the temperature is cooler in the early morning and late evening. Brain work such as using puzzle toys and teaching a new trick can be a good way to keep a dog busy in an air conditioned environment. Making sure your dog stays hydrated, especially during exercise. Reduce activity and give your pet frequent breaks to rehydrate. Be aware of your pet’s specific needs based on age, level of fitness and breed. Many dogs enjoy playing in a kiddie pool to keep cool. More information about heat hazards for pets can be found on the OHS website. If your home isn’t cool enough for you and your pets, options might include visiting a friend or family member, finding a doggie daycare for the day, or checking with your veterinarian or local animal services to see if they offer cooling stations. Plan ahead: know where you can go with your pets or arrange to have them stay during the heat. If you see an animal in distress because of the heat, please take immediate steps to help, in addition to calling local police. Provide the pet with a bowl of cool water; create a shady area where the animal can relax; set up a water sprinkler for the animal; knock on the doors of neighbors to see if anyone has access to the animal’s house. If possible, bring the pet indoors. OHS and your local police agency typically can respond only to calls about pets who may not survive without immediate help. If the animal is locked in a car, please see the section below about pets in vehicles. Fleas: Summer is also the worst time of year for fleas. If your dog or cat gets them, their whole environment must be treated, including the yard. Diatomaceous earth is a natural way to treat fleas in both indoor and outdoor environments, and can be found at most grocery stores. If your dog or cat and their environment are not treated, your pet may eat fleas, which could cause internal bodily harm (including tapeworms). You may want to contact your veterinarian to determine the best way to treat your pet for fleas directly. The Oregon Humane Society encourages you to leave your pet home and inside when you dash to the store or another errand. The inside of a car heats up very quickly. On an 85 degree day, a car’s interior temperature can climb to 120 degrees in 20 minutes, even with the windows slightly open. Write down the car’s make, model and license plate number. If there are businesses nearby, notify their managers or security personnel and ask them to make an announcement to find the car’s owner. If the owner can’t be found, call the non-emergency number of the local police and/or animal control and wait by the car for them to arrive. Can you break a car window to save a life? The public, as well as police, can now break a car’s window to rescue a pet or child in imminent danger without fear of being sued for damages. The new law, which took effect in June of 2017, protects people from criminal and civil liability if they break a car window to save a child or animal who is left alone and appears to be in imminent danger. Breaking a window is a last resort: before a Good Samaritan chooses to break a car window, law enforcement must be contacted (call police or 911 in an emergency). Rescuers must stay with the animal until first responders arrive or the owner of the car returns. Be mindful that a dog or cat may feel protective of their space or even run off when faced with a stranger. Symptoms of heatstroke include: restlessness, excessive thirst, heavy panting, lethargy, lack of appetite, dark tongue or gums, vomiting, lack of coordination or even collapse, and an internal temperature over 104° F.
Contact your veterinarian immediately if you notice these symptoms. Quick action could save your pet’s life. 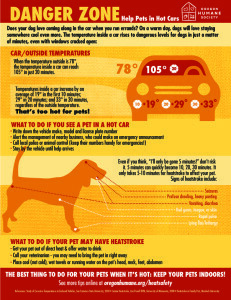 Help your pet cool down: First, get your pet out of direct heat. Check for signs of shock and take your pet’s temperature if possible. Offer water to drink. Then: use a fan to blow cool air on the pet; place water-soaked towels (or running water) on the pet’s head, neck, feet, chest and abdomen; rub isopropyl alcohol (70%) on a dog’s footpads for cooling (do not allow dog to ingest). Do not use ice-cold water or ice—use cool water to avoid shock. Safe cooling and consequences of heatstroke: “During a heat crisis, the goal is always to decrease the animal’s body temperature to 103° F in the first 10-15 minutes. Once 103° F is reached, you must stop the cooling process because the body temperature will continue to decrease and can plummet dangerously low if you continue to cool the dog for too long. Highly susceptible pets: Animals with flat faces, like pugs and Persian cats, are more susceptible to heat stroke since they cannot pant as effectively. These pets, along with the elderly, the overweight, and those with heart or lung diseases, should be kept cool in air-conditioned rooms as much as possible. 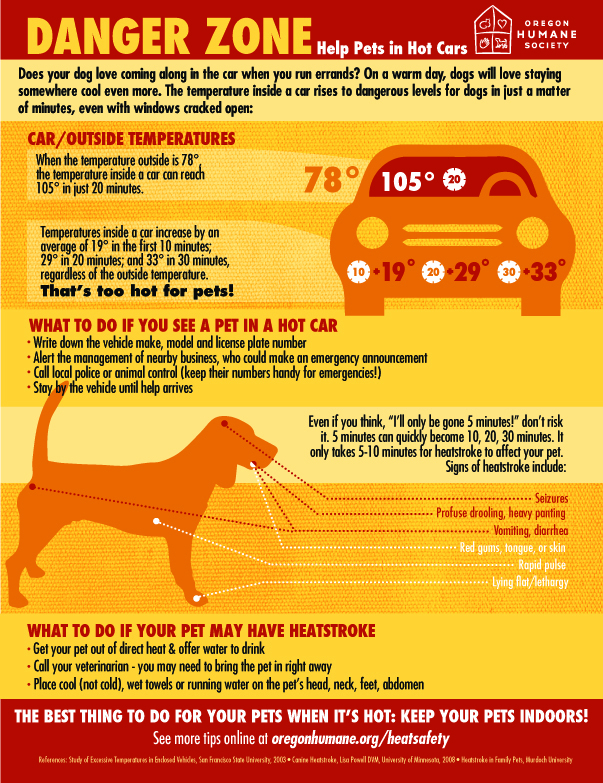 Note that a dog’s or cat’s normal body temperature is between 101 and 102 degrees. If you see an animal in danger: If you suspect an emergency situation has developed and an animal (not your own) is in immediate danger from the heat, first consult the owner if possible and then contact your local animal control agency or local police department. Pavement, asphalt, metal, and even sand that have been heated by the sun can burn dogs’ paw pads. Remember: if the surface is too hot for your bare hand or foot, it’s too hot for your dog’s feet. Post-Swim Sensitivity: Pads can be soft and more sensitive after swimming, so take heed if your pup refuses to walk on the pavement after a swim. Signs of burned pads include: limping or refusing to walk, licking or chewing at the feet, pads darker in color, missing part of pad, blisters or redness on the feet. First aid for burned pads: keep the foot area cool and clean. Immediately flush with cool water and a gentle antibacterial such as betadine. Get the dog to a grassy area or if possible, carry him/her. Keep the dog from licking the wounds. For minor burns, spread the area with antibacterial ointment and cover with a loose bandage. For serious burns, take the dog to your vet for further treatment. This is important to prevent infection and further damage. Another concern is dogs riding on uncovered pickup beds. The sun heats up the metal truck bed and can burn your pet’s pads. Have Rover ride in the cab with you, put him in a secure crate, or please leave him at home and inside a cool place. Generally speaking, keep your dogs off of hot surfaces whenever possible. OHS is the largest humane society in the Northwest, and adopts more animals from its Portland shelter than any other single-facility shelter on the West Coast. OHS puts no time limits on how long animals remain at the shelter—a pet stays available for adoption for as long as needed to find a loving home. If a pet in the care of OHS needs medical attention, the OHS veterinary hospital provides the pet with same level of care you would want your own pet to receive. Founded in 1868 by noted humanitarian Thomas Lamb Eliot, OHS is the third-oldest humane society in the nation and the oldest in the Northwest. Eliot initially established OHS to stop the neglect and abuse of draft animals. The mission expanded to include companion animals and, until 1933, orphaned children. To foster an environment of respect, responsibility and compassion for all animals through education, legislation and leadership. To care for the homeless, to defend the abused and to fight with unrelenting diligence for recognition of the integrity of all animals.